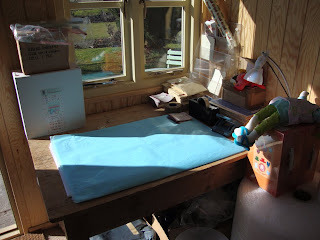 And a packing table with space to pack! Humphrey thoroughly disapproved of the clean up - he much prefers his environment scattered with bits of hay and cardboard, and piles of things to hide behind, not to mention his deep loathing for the vacuum cleaner. But he's not too bothered - wise old bunny that he is, he knows this won't last long. love a good clear out and tidy up!!!! Okay....I give up...where have you hidden it all? Wow! Can you come over to my house and tidy up? My niece has a rabbit the exact double of Humphrey! Her Lottie is a lionhead mixed breed. Found you through Catherine of Bumpkin Bears! 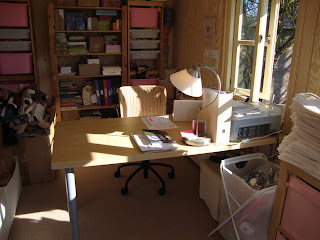 Spring cleaning was certainly in the air yesterday we have a summer house/office similar to your garden room at the bottom of our garden but sadly my husband has claim over this as his work space so mine is a tiny area at the back of the kitchen! 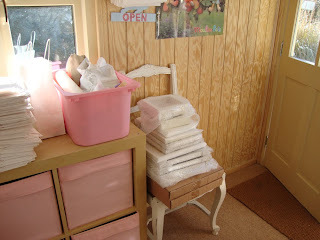 I shall perhaps follow suit and blog is later as I had a big sort out yesterday. Love the pink shelf draws! Hi again - sorry your a bit lacking lustre..are you mising Ernest ! You made me smile thinking of poor Humphrey & all those cats. People say you are either a cat or a dog person but I seem to be both - probably because we grew up with lots of pets. Even though mum was a full time teacher she was so laid back about pets! I could do without the hens sometimes though !